Launch trailer reveals new Hira humanoid form. 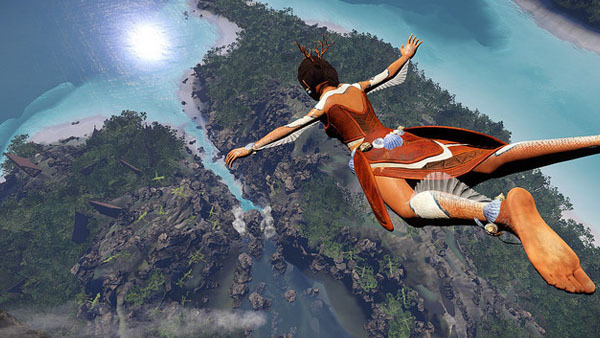 Wander, a “non-combat, narrative focused MMO,” will launch for PlayStation 4 via PlayStation Network and PC via Steam on June 4, the developer announced. The game sees players take various different forms, including that of a giant tree, an amphibian, and a griffin. The launch trailer, released today, reveals the new Hira humanoid form. She has gills and fins, which means she can swim, and she can use the fins as a wing suit when skydiving. She can also ride on top of griffin players and skydive between griffins. Get the launch trailer and fact sheet below. Have you ever wondered what sort of secrets are hidden amongst nature? Now is your chance to find out in Wander, the non-combat, narrative based MMO. Imagine the soothing sounds of tropical ambiance unfolding around you. Listen to the rush of waves as birds flying overhead call out to one another. Life is all around you; you are one with nature. You begin life as a giant tree with little understanding of who, or what, you are. You are brought to life by a rare flower, which holds powers that will change your course and reveal new areas. Enchanting opera singers guide you on your journey through the forest. Secrets are unlocked as you create friendships with other wanderers and piece together the unfolding storyline. The game encourages you to explore the beautiful world around you, seek out others like yourself, and take on new forms, each with their own unique abilities and stories. Unique communication system (Rozhda) that involves learning a unique language with a written and spoken form. Glyphs are drawn with a mouse or PS4 touch pad. Easy to pick up but deep flight mechanics, learn how to soar like a bird using simulated air currents and weather patterns. Designed by soaring pilots. Extensive narrative with different cultures explaining shape shifting via different myths and hinting at the deep mystery. Original music by award winning composer Benjamin Woodgates, performed live at the Royal College of Music in London and featuring notable opera singers and a 10-piece chamber group. Immersive and intricate sound design recorded by the Wander team in the Australian rainforest. Walk, fly, swim and skydive through the rainforest and reef experiencing the world through 4 different forms.